Betty Ruth (Deaver) Markham was born in Vinita, Oklahoma on September 30, 1923 to Dwight and Inez (Adamson) Deaver. During her younger years she lived in Miami, Oklahoma, later moving to Mead, Colorado to attend Mead High School where she graduated in 1942. On December 2, 1942 Betty married the love of her life, Willard G. Markham, at First Lutheran Church in Longmont, Colorado. They were married 66 years until his death in 2008. Betty and Willard moved from Longmont to their farm in Berthoud in 1945 where she helped work on the farm before getting a job with the City of Loveland in the Accounting Department, working from 1958 – 1963. In 1963 she began her twenty year career with Loveland First Industrial Bank, which later became Zions Utah Bancorporation retiring in 1983. In 1992 Betty and Willard moved from the farm to Loveland. 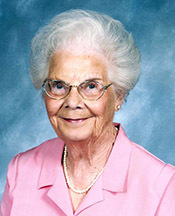 Betty was an active member of Trinity Lutheran Church, Dorcus Circle and Past President of Chapter HA P.E.O. Betty enjoyed bowling and golfing participating in a 9-hole Ladies League. Betty was a 4-H leader in Weld County and enjoyed teaching sewing to her 4-H girls. Betty enjoyed family gatherings and especially enjoyed hosting “happy hour” on Fridays with family and neighbors. She enjoyed entertaining family, neighbors and friends. Betty enjoyed traveling with her husband throughout the United States, Hawaii, Mexico, Canada as well as Australia, Tahiti, New Zealand and Fiji. Betty enjoyed her grandchildren and would try to attend their ball games out of town (Ordway) and (Berthoud), volleyball games (Johnstown) and attend their showing livestock at the Larimer County Fair. Betty is survived by her daughter Karol Anne Carter and husband Alvin of Ordway; Son William G. Markham and wife Elizabeth of Berthoud; sister Bonnie Deaver of Longmont; sister Joanne McGinnis and husband Jim of Loveland; five grandchildren and ten great-grandchildren; Godchild Cheryl Dollahan of Glendale, Arizona; brother-in-law Kenneth Markham and wife Beverly of Berthoud, many nieces and nephews as well as friends. Preceding her in death was her husband Willard and sister Shirley Morgan. Memorial services will be at 11:00 a.m., Thursday, October 15, 2015 at Trinity Lutheran Church in Loveland. Cremation has been completed. Memorial contributions can be made to Hearts and Horses or Loveland Elks Club rehabilitation project in care of Kibbey Fishburn Funeral Home. Site contents copyright © 2019 Recorder Online	except as noted. All rights reserved. | 90 queries in 2.259 seconds.